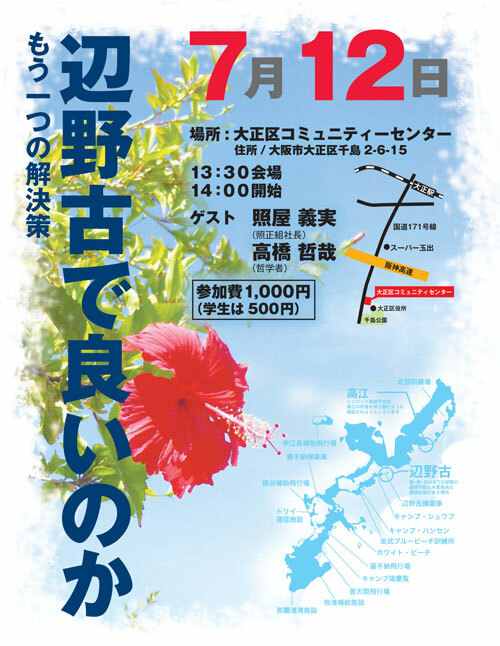 We are going to have a symposium to think about the current unequal political situation between Okinawa and mainland Japan. It is mainly about the relocation of U.S. military bases from Okinawa to mainland Japan. (not to Henoko, of course!lol)There’ll be two guest speakers in the event. The first speaker would be Yoshimi TERUYA, former president of Okinawan economic association.The second speaker would be Tetsuya TAKAHASHI, a professor of philosophy at the university of Tokyo.This talk session is going to be really interesting for both Okinawan and mainland Japanese. Don’t miss it!! Btw, the detail of this event is on the link above this sentences. Unfortunately, it’s in Japanese language, tho.